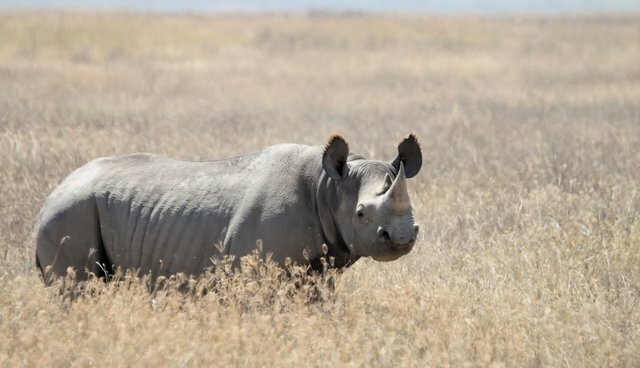 So far this year, more than 550 endangered rhinos have been killed at the hands of illegal hunters in South Africa, putting 2014 on track to being the worst year for poaching on record. Despite global efforts to combat the illicit trade in rhino horns and to protect rhinos on the ground with stepped-up patrols, the onslaught shows no signs of slowing. But now, in a move aimed at sending a message that the punishment for this crime far outweighs the reward, a South African court handed down a 77-year prison sentence to a recently convicted rhino killer. Poacher Mandla Chauke received the lengthy prison term for his involvement in the 2011 shooting of three rhinos in Kruger National Park. Two of the animals, a mother and her calf, survived the attack, while the third, a male, did not. Shortly afterwards, Chauke and two others with him were in a shootout with park rangers, during which one of the poachers was fatally wounded and the other escaped. Chauke was found guilty on multiple charges, including trespassing, stealing rhino horn, possession of firearms and ammunition, and also for murder of his accomplice. He also received 10 years for each rhino that was shot. After the sentencing, National Prosecuting Authority spokesman Nathi Mncube said the hefty punishment is designed to serve as a warning to others considering hunting rhinos illegally. "We hope that this sentence will serve as deterrence to potential offenders."